Osteoporosis is a disease of the bones in which bones become weak and can break easily. Bones become fragile. It occurs because bones start losing calcium and become thin. There is degeneration of the bone cells with advancing age and can lead to easy fractures. People who suffer from osteoporosis are prone to get fractures. Bones become so weak that it becomes very difficult for a person to stand straight and move. Density of the bones decreases which makes them weak and fragile. Fractures can occur easily. Slightest movement can cause fracture in the bones. Bones tend to bend easily due to weakness and stooping may occur due to weakness of the bones. Due to extreme weakness, even coughing and sneezing can produce fracture. People who suffer from osteoporosis are not able to walk straight and feel difficulty in performing the daily living activities. One should consult a physician after fifty years of age. Women are more prone to suffer from osteoporosis. It occurs because hormonal changes take place during menopause which causes loss of calcium from the bones. Osteoporosis is the most common problem in women who reach the age of menopause. Disorders of the thyroid gland are the most common cause of osteoporosis. Parathyroid gland is responsible for controlling the metabolism of calcium in the blood and any disorders of the thyroid and parathyroid gland can produce osteoporosis. Most common disorder is hyperactive or overactive thyroid gland that decreases the density of the bones by reducing the amount of calcium in the blood. Heredity also plays an important role in causing osteoporosis. Members of the same family may suffer from osteoporosis. Therefore, people who belong to the same family in which osteoporosis is a common problem should take precautions early in life to prevent osteoporosis. Hormonal imbalance is the most common cause of osteoporosis. Women suffer from osteoporosis when they reach at the age of forty due to hormonal imbalance. Chronic diseases such as crohn’s disease, kidney disease, liver disorders, and diabetes can also cause osteoporosis. Alcohol drinking can also produce osteoporosis due to defective metabolism of calcium. There is improper absorption of calcium in the blood which may cause osteoporosis. Pain is a common symptom in people suffering from osteoporosis. Bones ache due to weak strength. Person is unable to stand erect due to swelling and pain in the bones. Height may reduce with increasing age due to less bone density. Stooping may occur in people suffering from osteoporosis. Individuals suffering from osteoporosis are not able to walk straight and stand for prolonged periods of time. Divya Godanti Bhasm: This is a wonderful herbal remedy for the treatment of osteoporosis. It provides nutrients to the bones and help in reducing pain and swelling of the pains. It should be regularly taken to prevent signs and symptoms of osteoporosis. Divya Amrta/Giloy Sat: This is an excellent natural remedy for osteoporosis. It helps in reducing the pains. It increases the strength of the bones and also helps in balancing the thyroid hormones. It increases the strength of the bones and help people to get rid of pains. Divya Ashwagandha Churna: This is a natural medication for osteoporosis. People suffering from osteoporosis should try this herbal remedy as it helps in proper absorption of the food and calcium in the blood. It prevents loss of calcium from the bones by improving kidney functions. Divya Swarna Makshik Bhasma: This herbal remedy may be taken regularly to avoid any side effects produced by conventional treatment. This herbal remedy provides support to the bones and prevents osteoporosis symptoms to occur. It is remedy for the treatment of thyroid disorders that is the main cause of osteoporosis. Divya Yoga Raja Guggulu: This is another herbal remedy that has been used since ages for the treatment of thyroid disorders. This herbal medication for osteoporosis helps in balancing the thyroid hormones and provides relief from bone weakness. It prevents fractures by increasing the strength of the bones. Divya Praval Pishti: It is one of the best osteoporosis natural remedies that are safe and effective. It is indicated for women who suffer from hormonal imbalances during menopause. It acts on the pituitary gland and helps to balance the hormones to prevent osteoporosis. Divya Chandraprabha Vati: It is a natural osteoporosis remedy that provides strength to the bones. This remedy may be taken regularly to prevent the symptoms of osteoporosis. It is a natural osteoporosis remedy and helps to increase the strength of the bones by quick re-absorption of calcium from the blood. Divya Shilajeet Rasayan Vati: This is a wonderful remedy for men who suffer from any hormonal imbalance. It also helps in the treatment of bone diseases such as osteoporosis in men. 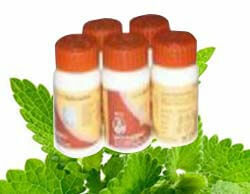 It is natural remedy for the treatment of bone diseases and for balancing the hormones. Divya Brihad Vata Chintamani: This supports the normal functioning of the digestive organs and also helps in the absorption of calcium in the bones. It prevents osteoporosis by giving strength to the bones. It increases bone strength and prevents fractures.